The US has designated a "critical habitat" for polar bears living on Alaska's disappearing sea ice. The territory includes locations where oil and gas companies want to drill. Environmentalists hope the designation will make it more difficult for companies to get permits to operate in the region. "This critical habitat designation enables us to work with federal partners to ensure their actions within its boundaries do not harm polar bear populations," said Tom Strickland, assistant secretary for fish and wildlife and parks. Any proposed economic activity in the area, which covers 187,000 sq miles (almost 500,000 sq km) must now be weighed against its impact on the polar bear population, Mr Strickland said in a statement. Most of the designated habitat is sea ice and includes some of the Chukchi and Beaufort seas, where the oil company Shell wants to drill. Shell was due to start drilling in the Arctic earlier this year, until the BP oil spill in the Gulf of Mexico brought the plans to a temporary halt. It is now aiming to start drilling in 2011. "Now we need the Obama administration to actually make it mean something so we can write the bear's recovery plan - not its obituary," said Kassie Siegel from the Center for Biological Diversity. Ms Siegel urged the US government to impose a moratorium on oil and gas drilling in bear habitat areas. 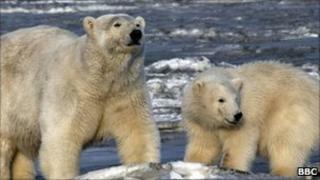 Environmentalists also want the polar bear to be listed as an endangered species. Currently the US interior department describes them as "threatened" or likely to become endangered because the sea ice on which they live and hunt is melting.